To use the Bentley’s resources more effectively, you will need to use a general U-M account to register for your Bentley research account. Have a U-M account? Click “Login” below to get started! Don’t have a U-M account? That’s OK! Click “Create” below to get started with a U-M Friend Account. Once you have a Friend Account, come back to this page and click the ACTIVATE button. Do you have a U-M account but are new to research at the Bentley? Have a U-M account and a Bentley research account? 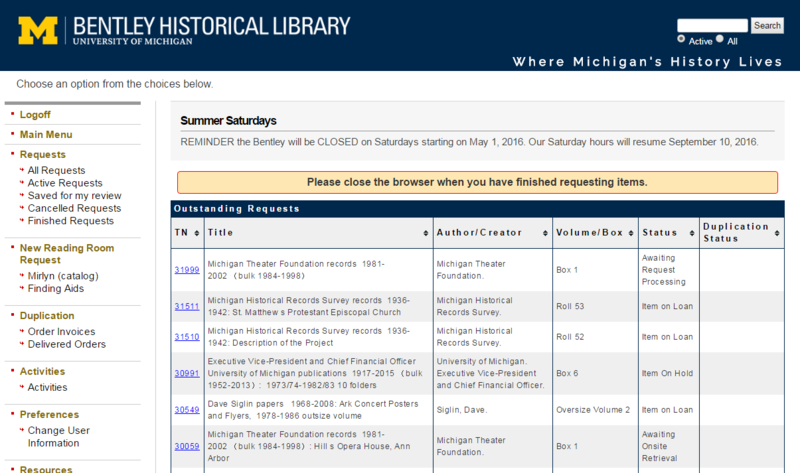 Once your research account is set up and you’re logged in, you may create a “New Reading Room Request” for materials from the MLibrary Search catalog, Bentley finding aids, Alumni Records Index, or Vertical File index. You can search any of our catalogs and databases without logging into your account. If you need help with anything, please contact the Reference team at bentley.ref@umich.edu or call 734-764-3482–we’re happy to help!